A former coworker set up a garage shop when he retired and decked it out with very nice Powermatic tools all purchased as a package deal. Now, 8 years later, his health has failed and he’s selling his house and liquidating his shop. I was really happy when he called to give me first dibs, and purchased this jointer for a VERY good price. All of his tools were lightly used and in very good condition. I had to break down the machine to get it down my basement steps, and is just got it set up earlier today. I’m so impressed that I wanted to do a preliminary review. The jointer is a heavy beast and is very stout, weighing in at 334 lbs with 66” total table length. The fence alone weighs -75 lbs. My friend is a pretty decent woodworker, but he’s not a super fussy type. When I asked him if he had a blade setting jig he handed me a planer blade jig and I realized that he had never changed the blades and the alignment was as delivered from the factory. And that’s what I have to rave about. The blade height is the exactly the same for all three blades, and they are just a whisper above the out feed table. They are so close that I believe I will only make things worse if I try to adjust them further. 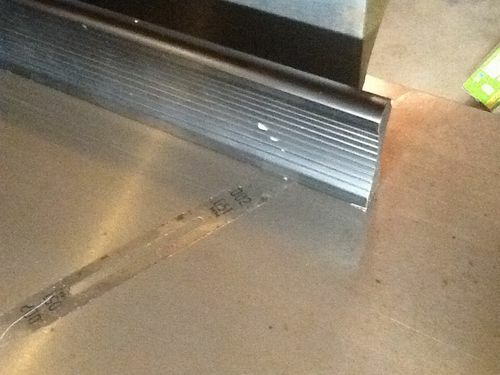 I’ve heard complaints about the tables on this jointer slumping over time, and I was worried about this, as parallelism is really important to me. When checked individually with a precision ground AL straight edge each table was dead flat, and I couldn’t get a .001” feeler gage to slip in anywhere. When I raised up the infeed table flush to the outfeed and checked for slump, I could just sneak the .002” feeler in at about 2/3 of the way out to the end, and could not get a .003” feeler in any where at all. In my estimation, this is VERY good for any machine. But given that I believe I evaluating the factory setup from 8 years ago, I’d say it is amazing. 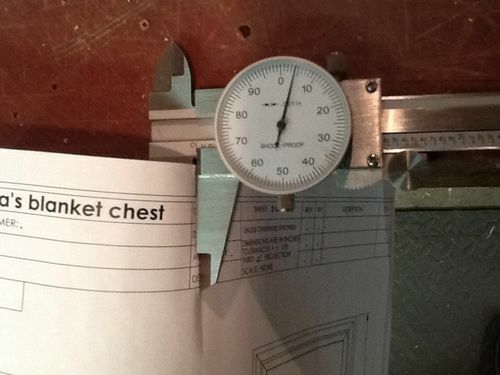 Keep in mind that a sheet of paper is .004” thick. When I re-mounted the fence I adjusted it to the 90 degree stop and checked it with a digital angle gage. 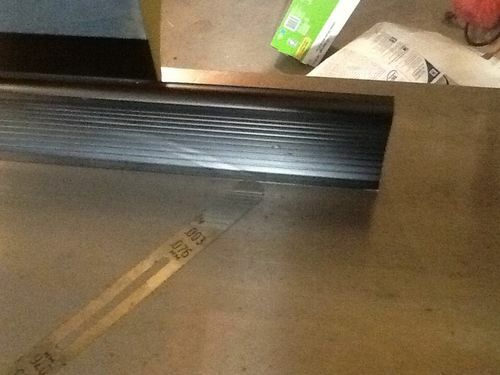 It read 89.9 degrees from one end to the other…. Not to shabby. I like the fence mechanism a lot, but suspect I’ll rarely move it. The fence is ground with an ever so slight cup from bottom to top, letting just a whisper of light sneak by my square blade, but I don’t think this will be a problem. The jointer came with a nice reinforced industrial duty belt and robust solid steel (not pot metal) sheeves and ran quietly enough, but since I had a good length of segmented belt on hand, I changed it out and it’s now even quieter. The segmented belt rides higher in the sheeves and made momentary contact with the sheet metal belt guard during start up, so I bent the guard out slightly with pliers to give more clearance. My friend had purchased the Powermatic mobile bases for most of the machines and the base for the jointer is very solid and stable. I only made a few test cuts, as I have to do a pretty significant shop rearrangement before I can hook up to my DC, but they were smooth and square… Which is what it’s all about. I’m glad it’s working out well for ya Matt. That 66” table is impressive. You can joint some long stuff on there. Glad it’s all you wanted and hoped it would be, Matt! thanks for the review. Looking forward to the update after it’s settled in. 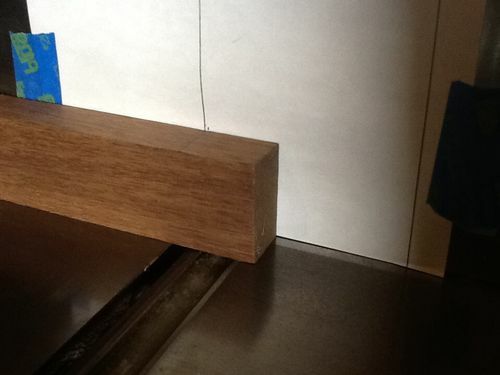 That is a sweet jointer. Congrats! Nice.No doubt it will be a nice addition to your shop. I have the helical head version of this jointer. I wondered if the 1hp would be enough to turn the helical through tough hardwoods. I don’t think the motor has ever slowed down on me. More than enough power there. The long tables also have a fence that is longer than anyone else. Powermatic went above and beyond on this one. Sounds like those machines have found a new home in which they can perform to their capabilities. I’m happy that you were able to obtain the nice machines and that your friend knows that his old equipment went to someone who will appreciate the quality of the items. Enjoy using them in good health brother. Congrat’s, I’ve had this same jointer for many years, and like yours mine was set up nearly perfect from the victory. enjoy your new machine. I’ve got the helical head version of this one too and it’s now in my second basement shop! Absolutely awesome machine, and the paint got a couple of chips running into my foundation but no, no paint problems what so ever. Love the 54! Best part of this deal was that it was win-win-win between the three parties involved. I received a deep discount and I brought a buyer to the table who bought other pieces at fair market value (as determined by recent auction sales) Everyone was happy. All the tools were in great shape. I would have loved to have bought his table saw, but I already have a pretty good one and was already on thin ice with the Mrs. Even with all the new tool manufacturers and technological gadgets, Powermatic never fails to deliver, good choice. That’s one sweet machine…..good find! 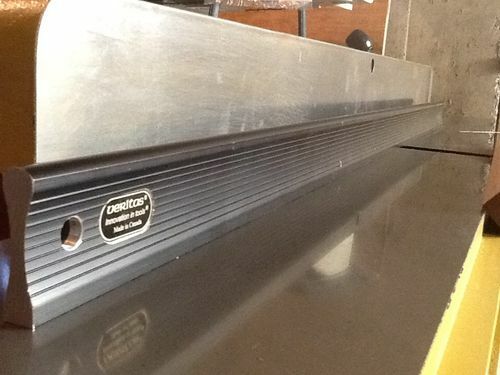 Sorry about your friend, and happy that you were able to acquire this beast of a jointer. Matt – Hope your friend is better. Very nice write-up. Thanks for sharing. I bought the 54HH, which I love. Now I’m ordering the mobile base. I was thinking of buying a Grizzly Shop Fox base for 1/3 the cost, but the curved front of the Powermatic base is so sweet. The problem with the PM mobile base is the it only has three wheels and is a bit tippy. I rarely move the jointer so I chocked the one wheel end with some shims. Though it does contour perfectly to the bowed front and looks very smart. I’d consider parting with mine for a reasonable offer.